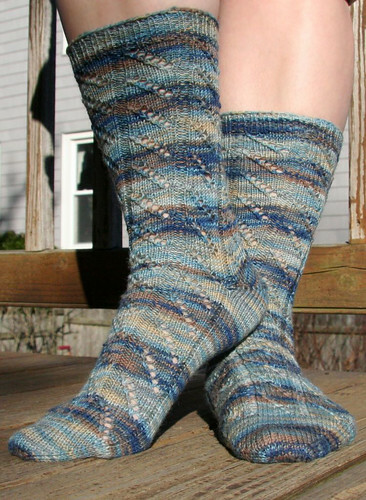 The last time we talked about these socks was back in July 2008 (yikes), when I had cast them on for a lace socks challenge. I made a silly mistake in the pattern that would have meant I had to rip back three or four rows to fix it, and I was still a new enough knitter that such a task was entirely too daunting, so I did what any sensible person would do: put them in the bottom of my knitting basket for 10 years and pretended they didn’t exist. 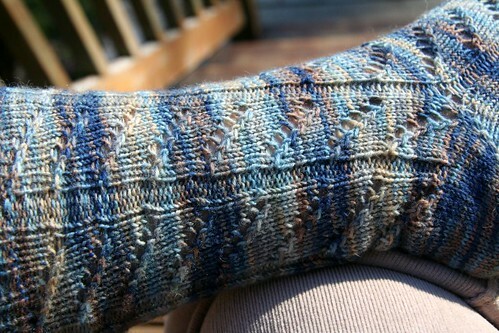 Every August, the Sock Knitters Anonymous group on Ravelry has a community KAL to finish in-progress WIPs, and I finally worked up the motivation to pick these socks back up again. Gosh, they just danced off the needles this time. I was glad to revisit Charlene Schurch’s brilliant book, which I had initially purchased primarily for this pattern. This time I read the note about how despite being a fairly open 8-stitch repeat, scroll lace knit in the round has a tendency to be less stretchy than one might expect because of the way the pattern falls on a bias. Therefore, I followed the recommendation to increase from 64 stitches on the foot to 72 on the leg, resulting in a perfectly-fitting sock. 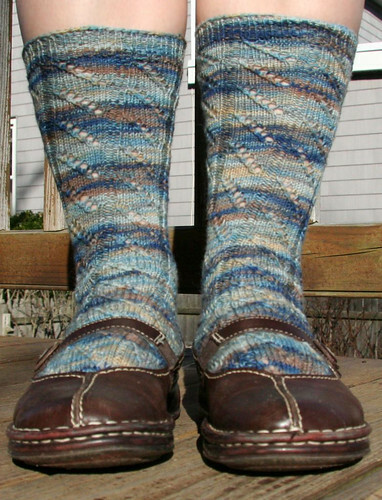 It was around the time when I started these socks that I discovered my favorite elements in sock-knitting, starting toe-up with a figure-8 cast-on and working a short-row heel. 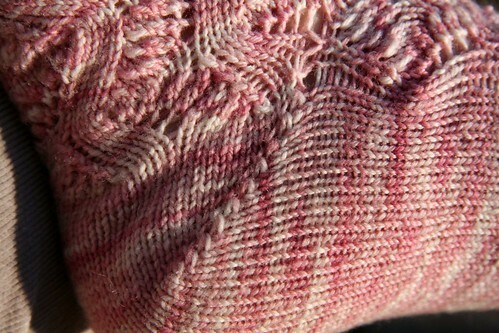 As with my Catnip Socks, I worked several rows in stockinette stitch (half a repeat) on the back needles after turning the heel. I used these rows to absorb the 8 stitches I increased for the leg, and I think it all worked out quite nicely. The scroll lace pattern is so intuitive I had it memorized by the first repeat, and it was great fun to work. 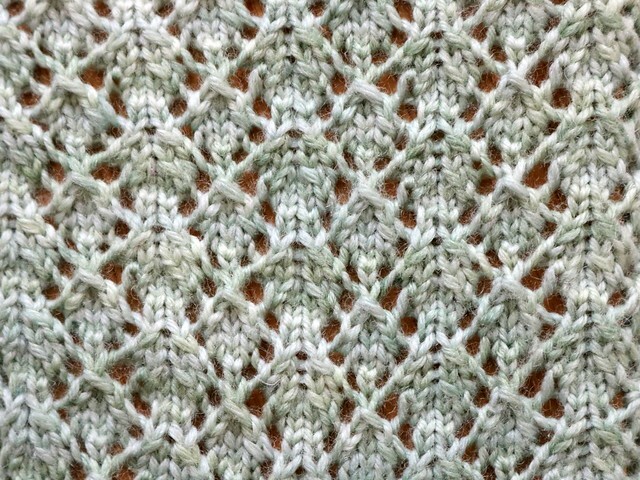 I love when lace is so high-impact from such simple combinations of yarn-overs and decreases. It makes me feel terribly clever as a knitter. 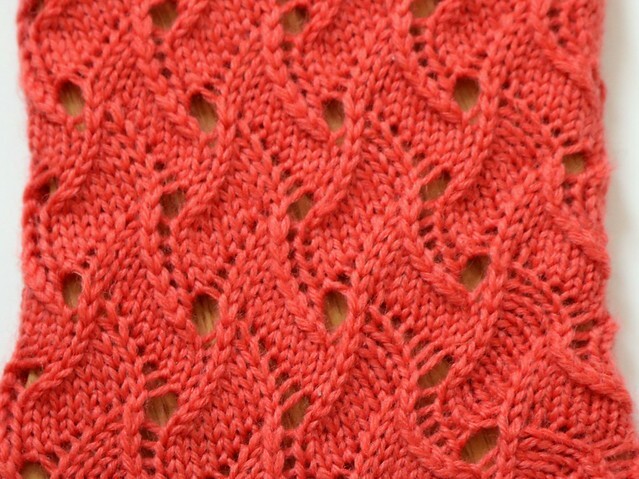 The saturated coral-orange color and lovely feel of the yarn made this project a pleasure through and through. 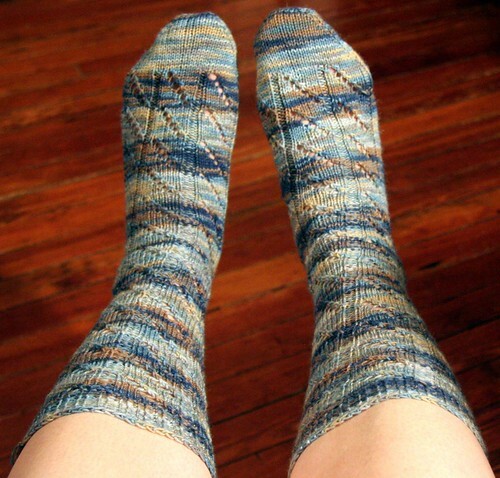 If I had known what a joy it would be to make these socks, I probably wouldn’t have waited ten years to finish them! 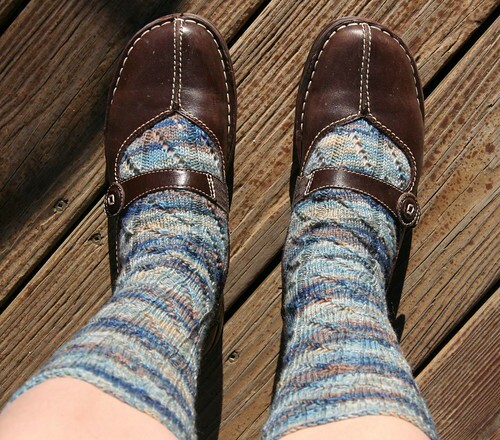 But I’m delighted to get to wear them now and looking forward to the next pair. 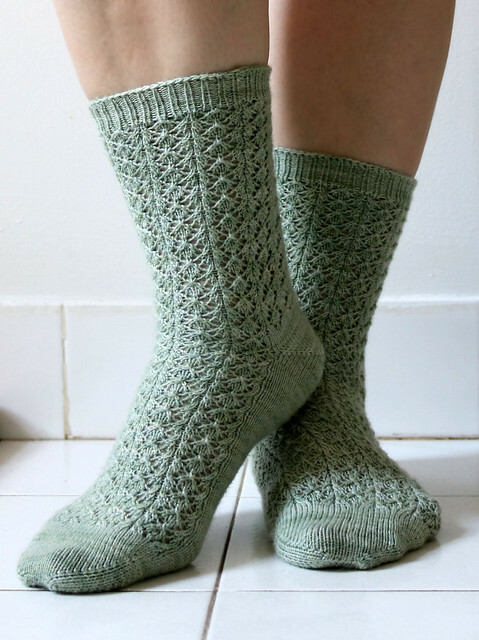 Toward the end of July, I cast on a new pair of socks on a whim, thinking it would be fun to participate in a Sockdown knitalong in a beloved Ravelry group for the first time in… oh, ten years or so… and this weekend I finished my Catnip Socks! I’m just delighted with the way these socks came out. 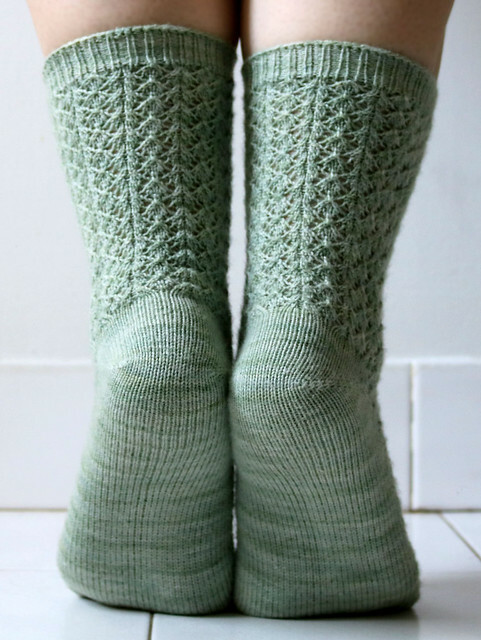 Something about the soft cool color, delicate lace, and fine gauge thanks to size 0 needles makes these basically perfect. 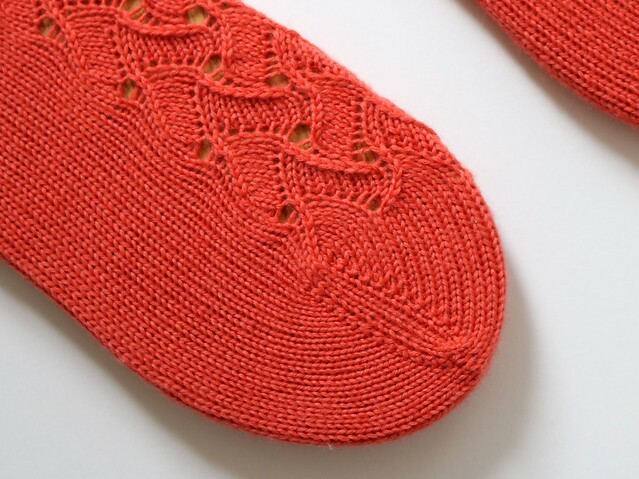 I was attracted to this pattern for the toe-up lace, which flowed neatly and was easy to memorize. I started with a figure-8 cast-on over 8 stitches and increased to 70 so the pattern would be continuous around the leg. I worked my favorite short-row heel by decreasing to 13 stitches (11 on each side), then I continued in stockinette for 1 pattern repeat (8 rows) to give a bit more depth to the heel before beginning the lace for the leg. I was somewhat irrationally nervous I would run out of yarn, despite the super generous 462-yard put-up. I had no reason to worry, as I still had quite a bit of yarn left after working my typical length legs and plenty of ribbing. I truly enjoyed working with this yarn, which was soft but strong and so subtly variegated that the color shifts were nearly imperceptible at times, building to a beautiful semisolid. I’m glad I have other colorways of this yarn in my stash, as I can’t wait to work with it again. 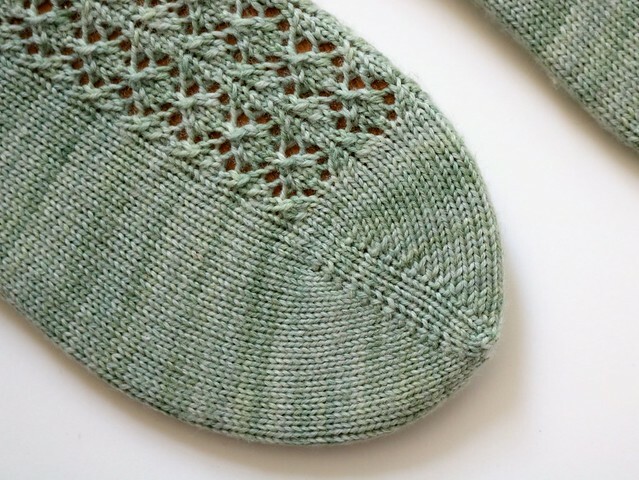 Everything about this project was a dream, and it reminded me of why I love lace, sock-knitting, and lace sock-knitting so very much. Not suprisingly, I’ve already got another pair of lace socks on the needles. 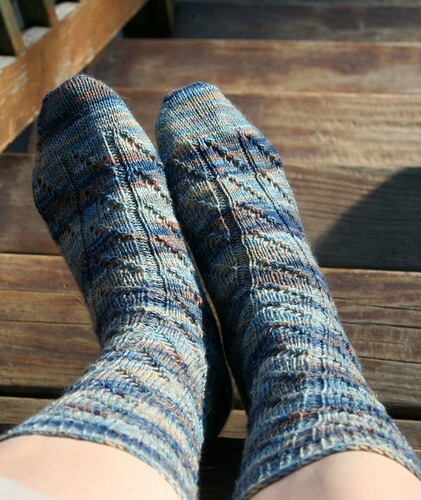 Another pair of long-finished socks, these were such a treat during last spring’s trip to Italy. Like broken-in jeans and a cushy sweater, these were instantly comfortable and felt familiar. 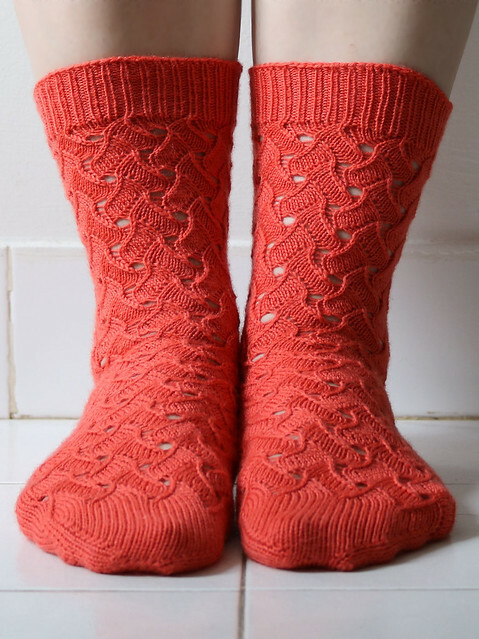 I’ve knit a pair of Eleanor socks before, but I was dissatisfied with the eyelets on those (I really should reknit one and finish that pair). For this pair, I followed the pattern and I’m so glad I did. This pattern is great – I’ve really enjoyed it immensely both times I’ve worked on it, and I’m surprised that it doesn’t get boring from something so repetitive. I knit 8 repeats up the legs, and though I had enough yarn, I didn’t feel like figuring out calf increases. Still, I imagine they’d look smashing as knee socks. I knit the majority of the second sock on the plane home, when I was utterly exhausted and couldn’t wait to be with my family and sleep in my own bed. My seat-mate, a college-aged guy from the UK, seemed genuinely perplexed by me, but I was completely unconcerned. At one point a woman walking by knocked my working yarn on the ground in front of the flight attendant’s drink cart, and it was a bit of a disaster as they rolled it over, pulling my sock and DPNs and all out of my hands and dragging it down the aisle. There is a break in the yarn, and even those little woven in ends elicit a fond smile whenever I see them. 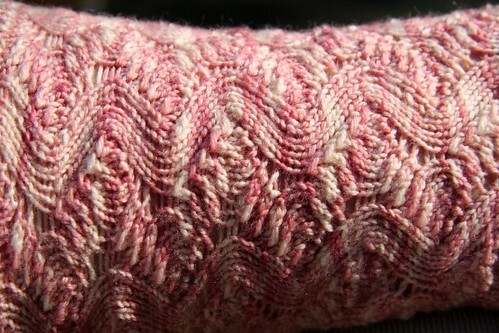 The yarn is sturdy and was very pleasant to knit with. I’ve always loved Regia and found it to be an excellent yarn at a great price. 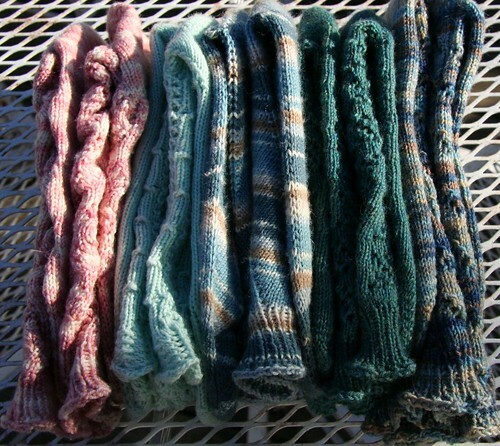 The subtly blended colors are delightful in person and they sustained my interest throughout knitting. The rich blues and warm, gentle browns and tans remind me of corduroy pants and flannel shirts, of the beach where the ocean and sand meet, and of mud flats at low tide with wind-bent cattails and a brilliant blue sky. In short, they feel like home. These are a bit of a flashback, since I finished them more than a year ago, but I still really love my Spring Forward Socks. These are probably the pinkest, most feminine, girliest socks I’ve ever made, and I just adore them. As you may have surmised, these socks are practically perfect in every way. The fit is wonderfully comfortable. Because I had so much yarn (seriously – the yardage for Smooshy is so generous already, and I still have 20 grams leftover! ), I was able to make the leg as long as I wanted. The lace pattern was wonderfully easy, and fun, and I love the way it looks. The springy shapes are playful and move the yarn in pleasing ways, while still maintaining an almost solid fabric, so they’re not too open to wear as trouser socks or what have you. 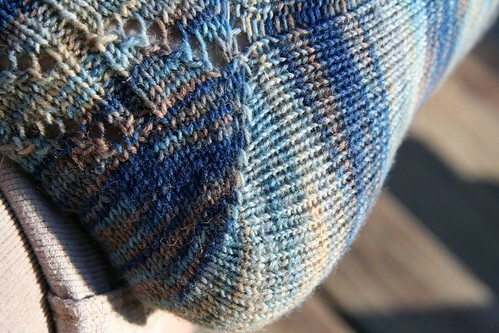 When I actually worked on these socks, they moved as quickly as, say, Monkeys, which made them very satisfying. I still haven’t found a heel I love as much as a short-row heel (which is probably not a bad thing), and these were worked with 10 stitches on each side and 13 in the middle. 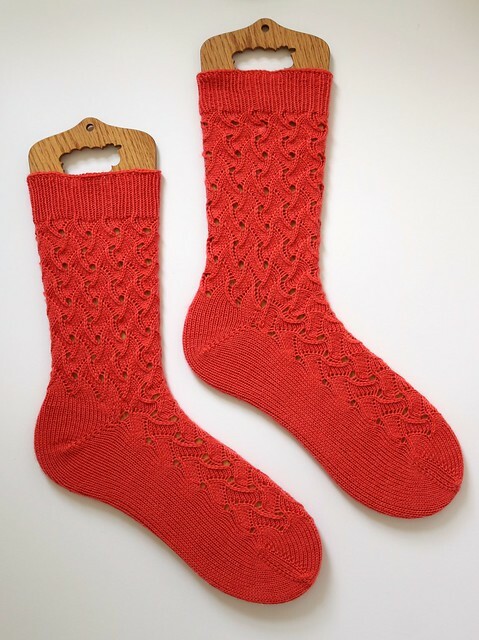 Apart from a wonderful pattern, I think what really made these socks for me is the yarn. I love this yarn so much I want to sing songs about it – the springy quality of the heavenly soft Merino is ideally suited for this bouncy lace, the colors are just variegated enough to stay interesting without getting distracting, the colors are lovely blends of pinks and creams so beautiful that I love every one, and the finished sock feels downright decadent on my feet. 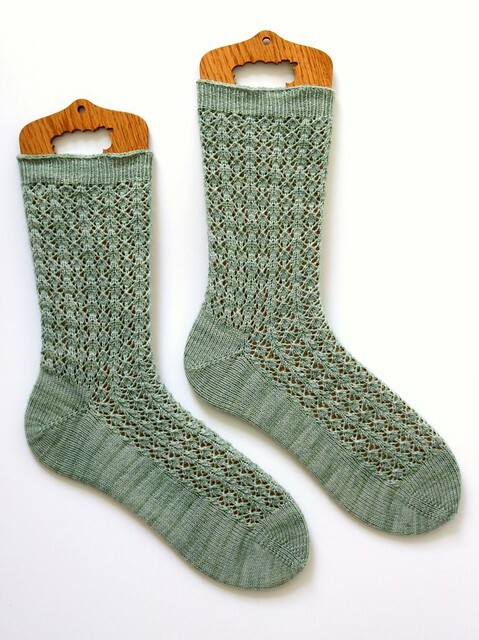 For the time it takes to make a pair of hand knit socks, it is very rewarding for them to feel so cushy and refined, like the luxury they really are. I will definitely be using as much Smooshy as possible in the future! As for these socks, I can tell I will be getting a lot of wear out of them, starting right away. I was perusing my hand knit sock drawer (yes, I finally have a drawer devoted to hand knit socks, and no it’s not a very large drawer, but still, it exists), and I realized I had five pairs I haven’t photographed yet, some dating to over a year ago (though two from last month, which, yknow, woohoo). That also means I have five pairs I haven’t been wearing, because I wanted them to be clean and new for their debut photographs… which is quite silly of me. Today we finally had proper sunshine, not the little peeks here and there that have been passing for daylight the past few weeks, and I took advantage of the opportunity for some sock photography. I’ll try to post a pair a day (or so) as I get the chance to write about them. But you can bet I will be wearing them immediately.